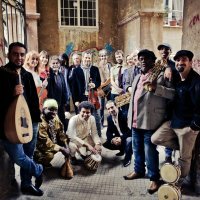 The musicians that make up this orchestra originate from ten different countries, they speak nine different languages and together they transform their variegated roots and cultures in one single language through the expression of music. 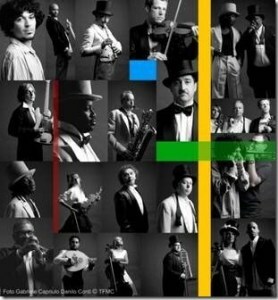 This is the Orchestra of Piazzia Vittorio which departing from the traditional music of each musician’s country, it fuses themes tinging them with pop, reggae and classical genres to reach a unique unprecedented musical experience. Amongst the musicians who alternate from time to time the sounds of the orchestra vary without abandoning the original vocation to beat new challenges and broaden horizons beyond the traditional world. A fusion of culture and traditions therefore, memories and sounds old and new played with unfamiliar instruments to produce universal melodies – a voice for the world. Having saved the Apollo Cinema of Roma which was risking to become a bingo hall, a group of musicians developed the idea of creating an orchestra which was in fact launched by Mario Tronco and Agostino Ferrente in 2002 within the Association Apollo II, a project supported by artists, intellectuals and cultural operators who believe in multi-culturalism and ethnic minorities. The orchestra of Pjazza Vittorio represents a unique reality; it is the first of its kind to have created places of work, work permits, and means of artistic exposure for talented musicians from all over the world. It suffices to observe them on stage to understand how happily they are able to convey a message of brotherhood and peace which are more efficient than official statements, meetings and broadcasting debates. Nevertheless, beyond its social value the Orchestra, promises research and integration of diverse musical repertoires mostly unknown to the public at large, and therefore institutes also a launching pad for musicians of various nationalities that otherwise would be confined to social and cultural emargination.